Christmas Eve, 1pm. Frantic, red-faced men (it’s usually men) charge around supermarkets and department stores. They’re looking for something. Anything. Underwear sets are picked up....what size is she again? They are put back on the shelves. Calendars emblazoned with the latest pop music sensations and those of yesteryear (hello Cliff) are thumbed, but remain unpurchased. The men make their way to the confectionary aisle, picking up the same box of chocolates that they have given as gifts for the last three years in a row. Their hearts sink. ‘These will have to do,’ they think to themselves. Christmas. It’s that time of year that you either love or hate. For most, the joy of the yuletide period knows no bounds, and even as early as October shops are filling the shelves with turkeys and mince pies and belting out those Chrimbo hits over the speakers. But one thing that scrooges and festive fans alike share is the difficulty in finding that perfect present for mum, dad, brother, sister, aunty, uncle or even the office Secret Santa. Getting the right gift that brings a smile to their face (at the right price of course!) can be a tricky task, and instead many of us leave it until the last minute in the hope that inspiration strikes. If that sounds familiar, then make 2015 the year that you change that by getting Christmas wrapped up nice and early. We’ve got the perfect answer: personalised sweet jars! First things first, this is a brilliant way to let a loved one know you care, whilst tickling their tastebuds at the same time. 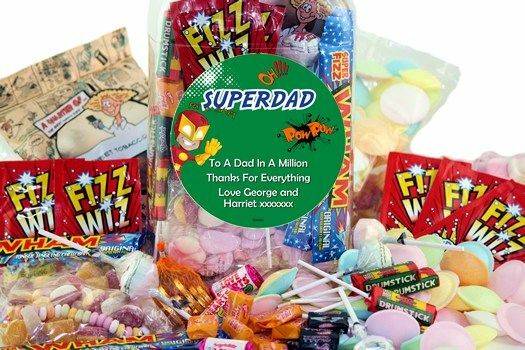 You can personalise the message on the jar and pick your own theme, so whether you want to let your mum and dad know you’re grateful for everything they do for you, a partner that you love them (what better way is there than with sweets!?) or just want to incorporate a fun theme like a Union Jack, a retro pattern or even a spooky label for a teenager with a love for all things creepy, then you can. The second thing that is much loved about our personalised sweet jars is that they come jam-packed with all those old favourites from yesteryear. 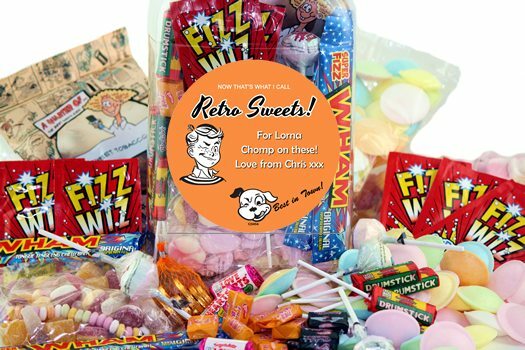 From Kola Kubes and Rhubarb and Custards to Cola Bottles, Milk Teeth and Candy Necklaces, these make for a fantastic retro gift that the recipient will be genuinely pleased to receive. Once all the sweeties have been devoured (it never usually takes long), the jar can then be used again to store loose change, keys or those other bits and bobs that we end up hiding away in drawers. And remember, they are available throughout the year too: a personalised sweet jar is for life, not just for Christmas. Whether it’s a birthday gift, an anniversary surprise or a spooky Halloween treat, there’s nothing quite like the gift of sweets. So don’t just go for the same old box of chocolates this yuletide, and don’t leave your shopping until the last minute either. Think outside the box, and inside the jar.